This roller coaster is Cedar Point's main attraction. 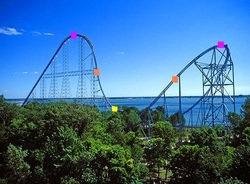 It stands at 310 feet, goes about 93 MPH, and is a 2 minute long ride. It features an 85 degree first drop, has an elevator lift cable system, tiered seating on the trains, and also has magnetic braking. Along with these features and an unpredictable thrill to any person willing to ride it, this roller coaster also broke 10 World Records when it first opened in 2000. This is what an electromagnetic brake looks like. A magnetic break is a device that uses magnetic forces in order to slow down a moving vehicle. 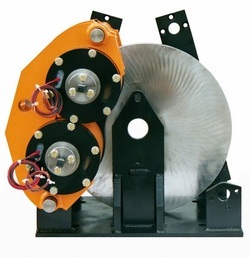 The most common type of magnetic brake is the electromagnetic brake. This works by electrical currents running through magnets which are attached to brake pads. The magnets clamp the brakes over a brake disk, which transfers the Kinetic Electromagnetic Energy into Kinetic Thermal Energy (in the form of friction), and stops the vehicle. What Could Happen without a Magnetic Braking System? Without the magnetic brake, the kinetic mechanical energy dictates when the ride will stop, potentially causing many dangers. With this magnetic braking system, the roller coaster will stop "on queue." Thepink represents where there is 100% Potential Gravitational Energy. The orange represents where this is 50% Potential Gravitational Energy, and 50% Kinetic Mechanical Energy. The yellow represents where there is 100% Kinetic Mechanical Energy. As you can see, as the coaster goes up the next hill, it gains more Potential Gravitational Energy. My diagram is a little bit off, because there can never be 100% Potential Gravitational Energy after the first hill, because none of the hills after the first hill are the same height, or taller than the first hill. But my point was that at the top of the next hill, the Potential Energy is almost 100%, because of the height.